This is the most important hexagonal fortress in Europe, according to UNESCO, on whose Tentative List it has been inscribed since 2006. “Today, the World Heritage List does not include any similar example, except for Suomenlinna in Finland, which dates back to the same period but is completely different from the geographical and historic points of view”, reads the UNESCO website. 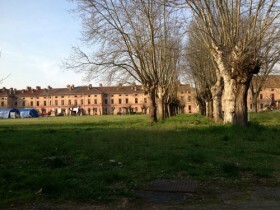 The fortress is located north-west of Alessandria and is separated from the city by the river Tanaro. 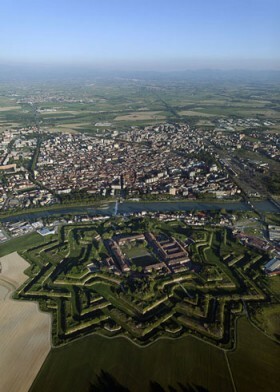 Spreading over 74 hectares, it is a perfect example of a modern-type fortification with six bastions. Designed by the Italian military architect Ignazio Bertola and built between 1732 and 1808, the Citadel was the setting of several key moments in the history of both Italy and Europe. During Napoleonic times, it was one of the most important fortresses of the Empire; during the Italian Unification, it was a symbol of the revolutionary movements in favour of the Constitution. The slow degradation of the monument started in 2007, when its military use ended. The most imminent threat is the proliferation of a very invasive weed, the roots of which are seriously undermining the walls and threatening the integrity of the fortification. The ailanthus has already affected a 7.2-hectare area. Its eradication requires specific skills and an incisive plan, and is estimated to be a costly and prolonged process. Major restoration works of the ancient structures are also needed. The local community is strongly attached to their Citadel. In 2012, it was the highest-placed monument, receiving 54,000 votes, in the census ‘Italian Places I Love” promoted by FAI - Fondo Ambiente Italiano. Thanks to the work of volunteers, the site is partially accessible for visitors on different occasions. The local and national authorities are fully engaged in making the Citadel viable but they need widespread inter(national) know-how and financial support. Fondo Ambiente Italiano, which made the nomination for ‘The 7 Most Endangered’ 2014, believes that the site should not only be restored but brought back to life by promoting new social and economic uses, such as an educational centre, a university, housing and tourism facilities. FAI advocates that this can be achieved without spoiling the look of the fortress but by exploiting its characteristics and potential.